Vine Youth Ministry (VYM) was founded by Daniel and Amanda England in 2006 after trying to encourage young people to come to Sunday School with limited success. They decided that if they couldn’t get young people to come to church, then the only course of action was to take church to them. Daniel was teaching music in several local schools at the time, and started by offering assemblies to just a few schools on a monthly basis. 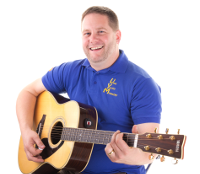 These proved to be very popular and over the next couple of years Daniel found that more of his time was being taken up with assemblies, allowing little time to do any music teaching. In 2009 VYM became a registered charity and Daniel stopped music teaching in the schools to focus his attention on the ministry. The ministry continues to grow and offers the young people it serves a glimpse of what having a personal relationship with Jesus can be like. How God loves each and every one of them, how He is always ready to listen to them, and is the one true God that they can always depend on; teaching the fundamental Christians values of love, joy, peace, patience, kindness, goodness, faithfulness, humility and self control. VYM make no charge to the schools for the work that it does, relying completely upon donations from churches, organisations and individuals who share the same passion for God and for the young people that it serves. Please check out the rest of the web site to find out more about what we do and ‘Contact Us’ if you would like us to come and talk to your school, church or organisation, or to discuss how you can support the work that we do.